Eeew most people would say. 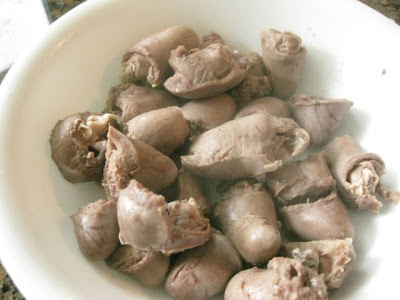 Once in awhile I get a craving for chicken hearts. In Singapore, this is usually served with Chicken Rice. I saw them at Osaka supermarket that day and bought some to try. Chicken hearts have a unique, chewy texture. D said he'll try everything once and so he did - said it tastes like chicken. Not something he'll eat again though. Good man, my poor guinea pig will eat all the strange Singaporean food I attempt to cook. The chicken hearts are tasty BBQ too. I've eaten them at a Brazilian churrasco place before. Just skewer, lightly salt and pepper then BBQ. You can fry them in butter too. Butter makes everything taste better don't you think? These are super high in cholesterol though and not something you should be eating too frequently. Satisfied my craving. I've never cooked chicken hearts before so this was trial and error. Clean and cut off the fat. 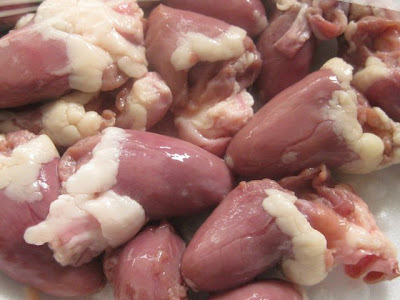 In the end I just covered the chicken hearts with water, cut a few slices of ginger and added some salt and boiled for 20 min. Just make sure that is is fully cooked and there is no more blood flowing.